The intersection of craft and interiors has long been the realm of Hennepin Made. 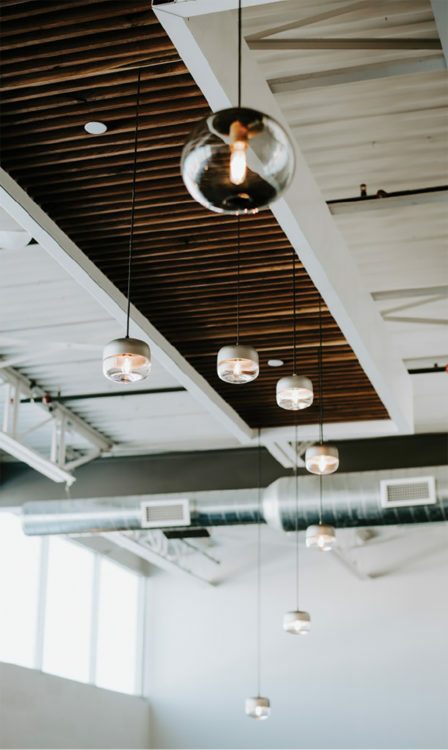 The Minneapolis-based modern glass manufacturer, best known for its lighting fixtures for Room and Board, is taking its commitment to both to the next level with its expansion into a new campus in the North Loop. Founded in 2011 by glassblowers Jackson Schwartz and Joe Limpert, Hennepin Made utilizes centuries-old glassblowing techniques for its collection of lighting fixtures and glass goods. The new 30,000-square-foot space, located in a historic former glass warehouse in the North Loop, is home to the company’s headquarters and manufacturing facility, as well as a retail store that features Hennepin Made’s lights, colored-glass vases, glassware, and candle holders. The store also features goods by other makers such as local quilt brand, Louise Gray, Québec-based culinary-tool company Maison Milan, English furniture maker Ercol, and Japanese kitchenware brand Kinto. The multi-concept building also includes co-working space, a café, and event space. Hennepin Made has put its stamp on just about everything in the building—for instance, its line of Parallel lighting fixtures is showcased above the coffee bar. Incorporating Hennepin Made’s own products throughout the warehouse helps to “create context for our product,” says Schwartz. Find out more about Hennepin Made and Room & Board.